It’s official- New Delhi is the worst city in the world forfinding parking. 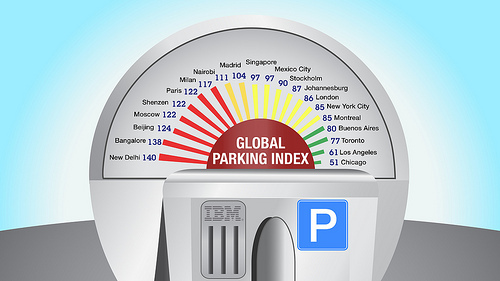 IBM compiled the results of the survey into its first-ever Parking Index that ranks the emotional and economic toll of parking in a cross-section of 20 international cities, with the highest number being the most onerous. The Index reveals a wide range in the parking pain experienced from city to city. Chicago had the least pain when it comes to parking in the cities studied, followed by Los Angeles and Toronto. New York fared better than London, and on par with Montreal. The IBM Parking Index is comprised of the following key issues: 1) longest amount of time looking for a parking place; 2) inability to find a parking place; 3) disagreement over parking spots; 4) received a parking ticket for illegal parking; and 5) number of parking tickets received.